Well kept brick homes rarely need painting, but if you the owner no longer appreciate the color or the condition of the brick, it may be time to paint it. You should chose a paint color you will can live with for decades. The rule of thumb for houses is to choose a color that meets the requisites of your subdivision or your neighborhood. While your neighborhood might not demand you follow any guidelines, just your proximity to other homes should help you determine the range of colors that would complement the neighborhood. Is Painting Your Brick Home the Best Choice? 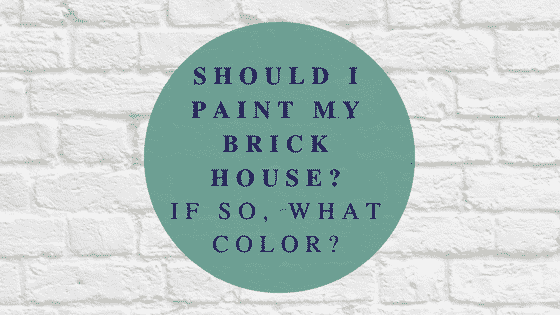 First, the decide if painting your brick house really makes sense, consider alternatives first. Try pressure washing your brick to give it a refreshed look. If you’re still not satisfied with your home’s facade, consider refreshing the trim. Finally, paint your front door, your window trim, your shutters and renovate your front entry. Upon observing the finished product, this is the point where you can determine whether to paint your brick home. Upon deciding that painting your brick home is the option you want to use, you now must select a color. Choose from a fairly small grouping of colors as exterior paint is not available in a huge range of tones. You’ll want to consider colors that complement parts of your house that will not change such as your roof. Compare the color selected to the colors of your porch railings, columns, visible foundation and anything else you will not paint. What color are those elements of the house? You’ll want to select a color or colors that complement the existing tones on your home. Roofs range in shades from black to dark greys and sometimes a copper tone if you have a terracotta tiles or metal roofing. Colors that work well with black or dark gray roofs include contrasting colors like white, cream, light greys, olive green, or a combination of similar colors. To paint a brick house, your painters will have to spray the paint on or spend extra time painstakingly applying the paint by brush to all the nooks and crannies of the brick face. House colors that look good with copper roofs include white, cream, a pale yellow, a pale grey, taupe, a pale grey-green and medium grey. Naturally, you may need variety in the colors. Your shutters and window trim can be another complementary color to create a total look. Exterior paint colors include tones like a wide variety of whites, creams, tans, greys and black. Yes, other colors exist, but these tones range from calming shades of various colors to shockingly bold colors. The shockingly bold colors of exterior paint colors are verve violet and grandiose, a golden yellow. One very tasteful color scheme of calming colors using a nautical theme was made up of a dark grey-blue with white and darker grey trim sporting front door in Renwick Golden Oak. Another calming theme used a pale greyish-green called Rare Grey with Ethereal White trim and a Poppy Flower, red front door. And yet another relaxing color scheme put Casa Blanca (cream) next to Rosedust (pink) trim and a Grand Canal (green) front door. Brick homes that choose a palatable theme of colors should end up with a lovely home, one that will be welcomed in the neighborhood. Choosing a color could be done by any number of methods. One method could be choosing a color scheme that reflects the history of the area. Another method could be to reflect the region as in the Southwestern use of terracotta roofs and sun-washed stucco. If the region has a wide range of modern homes, almost anything goes. The steps used to paint brick house include choosing the colors for the brick and the trim. Next, comes the prep work. Clean the brick to remove any loose debris that may be adhering to the surface. Use a hose and a stiff bristled brush as opposed to a pressure washer, which may be too harsh on the bricks surface. To remove dirt effectively, try using soapy water, water mixed with trisodium phosphate, a slightly stronger substance that should remove those stubborn stains. If you encounter mildew, try using a solution composed of one part bleach and two parts water to remove it. Let the solution stand for 10 minutes before scrubbing with a stiff bristled brush. Wet the surface with a hose. This insures greater adhesion on the acrylic primer. The next step of prep is to use a paint sprayer to apply a neutral primer. Now, its time to apply your paint. Hopefully, you’ve selected a paint appropriate for brick such as elastodynamic paint that has a lot of elasticity and can easily fill the nooks and crannies in brick and mortar. Elastodynamic paint is more is mildew resistant and performs well under different weather conditions such as high heat and humidity. The preferred paints for exterior brick are semi-gloss and gloss. If you decide to use a brush, it should be a very thick napped brush. Apply a thick acrylic based masonry paint and overlap the paint strokes to insure good coverage. Whether you decide to use a brush or a paint sprayer, paint the area with an overlapping process. The final product will look great and will be a source of pride for the neighborhood. Converting your brick façade from a worn and tattered to a freshly painted and revived is achieved with a coat of paint. Paint your home a complementary color or colors and watch the response in the neighborhood. If you paint your brick house, you and your neighbors will observe a new lovely home. It will suddenly appear in the neighborhood and behold, it’s your home.